Well, I did it! I read the Sourcebook, cover to cover, every word. What do I get? Uh? What's my prize? I'll tell ya, it was an enjoyable read. I read it casually, a section at a time, when the mood struck me. I love the D6 Star Wars game. I love it passionately. But, this book brings more to the reader than just game stats and game material. It's a Sourcebook for Star Wars. True, the book was written before the prequels, before the new movies, just before the EU exploded (where other D6 SW books were written as the EU was exploding), and before the new canon. AND THE BOOK STANDS UP EXTREMELY WELL! I was amazed at that. There are a couple of things, here and there, that have later contradictions, but those things were minimal. Truly amazing! If you like details, the way I do, then you will dig this book, too. As long as I've been a fan of Star Wars, I actually learned things in this book. :: That the Y-Wing has a special handle on its nose that ground crew use to maneuver the ship around in a hanger. The handle engages the ship's repulsorlift drive and allows one man to physically drag or push the ship into tight spaces. I love details like that. :: There's a cross-section cut-away of the X-Wing detailing the ship's primary components. :: That a standard Imperial Star Destroyer carries 72 starfighters. A schematic shows the breakdown. :: That the nature of space travel in the Empire is a lot more regulated than I had ever thought. :: There's a deckplan map of the Millennium Falcon! :: That repulsorlift vehicles use all sorts of devices to aid in thrust, from sails to turbine engines. :: That the Sullustans are from a world that is volcanic and has thick, billowing clouds of noxious vapor. The Sullustans are a race that live under ground. SoroSuub is the largest Sullustan company that supplies goods to the entire Empire. And, that company has taken over governmental control of Sullust. :: That the Twi'leks are a race that has lower technology than the peoples from an average Imperial subject world. Those who leave Ryloth typically live a Fringe existence. :: That Banthas are not native to Tattooine and found on several worlds around the galaxy. :: That Space Slugs do not normally grow to the size of the one seen in TESB. That one is a slug of myth. :: The various types of Rebel Bases. And, a lovely example of a base with a map. :: A breakdown of just how much Han Solo owes Jabba The Hutt. And, oh, so much more! That's just a taste of what this book provides! I'm glad that I took the time to read it in such detail. I always wanted to use that rebel base map to make a SWMB gaming table. Ah yes, the good ol' Tierfon Rebel Outpost. A couple of my rebel spec ops campaigns were based out of there. They made a colored version of the map for an FFG book. 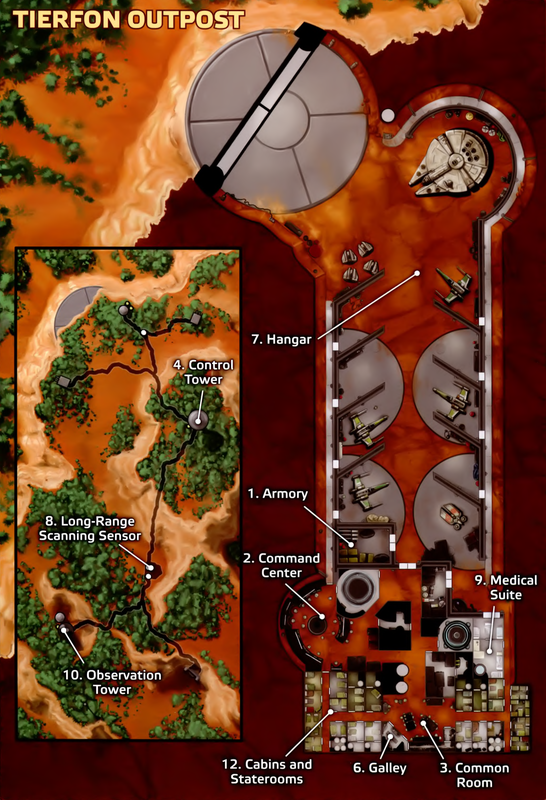 Tierfon Outpost was always my favorite example of a Rebel base. Yeah, if there's one book WEG published that could totally sum up SWD6, it is without doubt the Star Wars Sourcebook. And let's not forget the modular Imperial garrison design as well. A mass-produced, rapidly-deployed base that can be deployed from any Imperial-class Star Destroyer at any time anywhere in the galaxy. That is what military force projection is, ladies and gentlemen. Yup, this book is awesome. It's even better that it's held up to the test of time as well.